Take A Look At Heathrow Real Estate: A Master Planned Gated Country Club Community With Lakes, Parks & More! This community engulfs approximately 1,800 acres and features 1,900 gated homes in 30 unique neighborhoods. This massive master planned and gated community is managed through a network of associations. 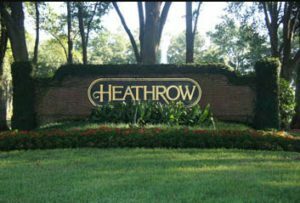 The Heathrow Master Association primarily covers common areas along Heathrow Boulevard and Sawyer Lake Park. Then there are a series of 13 Neighborhood Associations that are responsible for their respective subdivisions. Finally, there are Neighborhood Committees and a Town Advisory Council (TAC) that is comprised of neighborhood committee chairs. As you can imagine, this massive network of neighborhoods offers activities, groups and outdoor fun with something for everyone in the family. For more information visit the Heathrow Community website. Otherwise, take a look at some of the gated homes for sale from the Heathrow real estate experts at Gitta Sells.